I have put together a top 25 list that I will post over the next few days in incriments of five teams. Tomorrow will be #16-20 and so on. Enjoy! 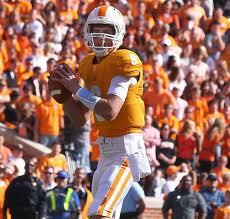 Bray is one of the best young NFL quarterbacks in the country and should help keep Tennessee relevant this year. 21. Tennessee- I am a huge Tyler Bray fan and that alone makes me think that Tennessee is ready to surprise some people. They may not be returning an abundance of elite SEC talent but I think they have enough talent on offense and on defense to compete in the SEC. They might not end up in the top 25 by the end of the season, but no one thought they would end up in a bowl game after their awful start last year either, and Bray was having none of that. A good or great QB can reverse the fortunes of even the worst teams, and Bray is living proof of that for Tennessee. This is his first full season as a starter, so it will be interesting to see if he can maintain the success he had late in the year last year, but if I had to pick I would anticipate him to continue to play well, even if he has a bit of a sophomore slump. 22. 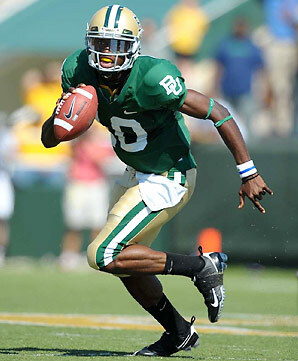 Baylor- I may not be a fan of Robert Griffin’s NFL prospects, but he has the upside to be a very good college quarterback and he has a chance to lead a Baylor team that is returning most of their talent (if not almost all of it). They have a lot of quality players on offense, led by Josh Gordon, a big, physical receiver with a listed 40 time of 4.42 (who I am very high on). They should have a very productive offense if Griffin can pass more accurately than he did at times last year, but he should be 100% healthy by now and won’t be as rusty as he was at the beginning of last season which should help the Baylor Bears prospects. Additionally, Baylor has some talent on defense worth noting and could have a pretty nice pass rush this season. 23. Mississippi State- The Bulldogs took the SEC by surprise last year and walloped Michigan in their bowl game last year thanks to a brutally effective rushing attack predicated on power. They lose some talent to the draft but they return talent on both sides of the ball, so it will be interesting to see if they can string two good seasons together in a row, or whether they won’t live up to expectations now that they have been raised. If they can get the ball out to Chris Smith (who I think is poised for a break-out season) they could have a more significant passing attack than they did at times last year. Gilbert had his struggles last year, but we all saw flashes of potential in him against Alabama two years ago. If he can recapture that then Texas could be a dark-horse in the Big-12. 24. Texas- Texas is always good with recruiting and they have a lot of returning talent, but like so many teams their quarterback will make or break their season. 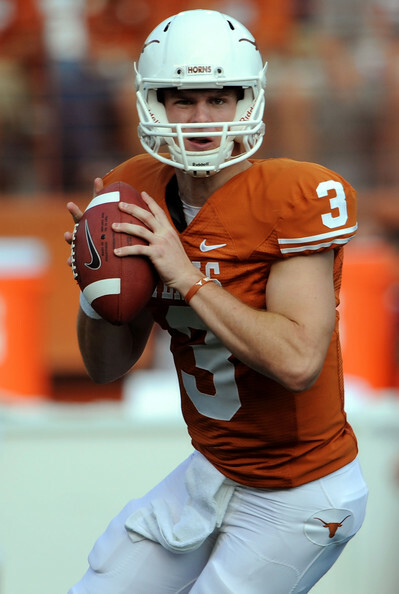 Garrett Gilbert didn’t have a very good season last year (260/441, 59% completion, 2744 yards and 10 TD’s with an out of control 17 interceptions, plus 380 yards and 5 rushing TD’s) and if Texas is going to legitimize themselves as a contender they are going to need him to step it up. The flashes of greatness he showed against Alabama were nowhere to be found last year, and if he doesn’t recapture the poise and accuracy he flashed in that game two years ago then Texas is going to be in trouble, regardless of how much talent they are bringing in. 25. BYU- BYU has definite upside because even though they may not be a powerhouse they have a quality quarterback in Jake Heaps, who as a true freshman managed to complete 219 of 384 passes (57% completion) for 2,316 yards, and 15 TD’s with only 9 interceptions. Those are impressive numbers for a freshman, and he really stepped up against UTEP in their bowl game when he had his best game of the season with his 2nd highest career total in completions and he tied his career high for touchdowns with four. Heaps may not be a big guy, but even though he’s about 6’0” 195 he can sling the pigskin and he will give BYU a chance to remain competitive for the next three years if he stays healthy. Look out for more rankings in the coming days! Thanks for reading! Griffin has impressive arm strength and athletic ability, but as of now he is not as good of a quarterback as his stats might indicate. Griffin has been getting hype after he completed his second impressive season last year. He threw for 3,501 yards (completing 304 of 454 attempts for a 67% completion rate with 7.7 yards per attempt) with 22 touchdowns and only 8 interceptions. Additionally, he amassed 635 yards (4.26 yards per attempt) with an additional 8 touchdowns. Overall, a very productive season. However, as often is the case with quarterbacks operating out of spread offenses like the one Griffin runs at Baylor, statistics rarely tell the whole story. While Griffin may be a good college quarterback, not much of his game as of today would translate effectively to the NFL. Time will tell if he can improve in the aspects I will break down in this scouting report, but right now I would not project him as a NFL QB, rather I would expect that he would be asked to try out as a receiver. Size: Griffin is listed at 6’2”, 220 pounds which is solid size for a quarterback. I have a feeling he’d measure in at closer to 6’1” if measured today, but that is obviously just my gut feeling considering that QB’s height measurements are often inflated, plus he doesn’t look that tall to me on film. He looks relatively skinny on film as well, so he could stand to add weight to his frame. Arm Strength: Griffin has very good arm strength. He does a good job of putting zip on his throws and has a live arm. He can make every NFL throw in terms of arm strength, and throws a nice deep ball when he can place the ball correctly. He has enough zip on his throws to get away with staring down his receiver that he intends to throw the ball to without the defender making a play on it. He doesn’t have a spectacular arm, but his arm strength is definitely his most valuable attribute as a quarterback. Accuracy: Griffin’s accuracy is one of the most disappointing parts of his game. He flashes the ability to deliver a throw in stride, especially on deep balls, but on other passes his accuracy is much less consistent. He can hit relatively stationary targets when he is scrambling (for instance, a receiver coming back to the ball near the sideline) but does not place passes well over the middle or down the seam. He routinely overthrows receivers and struggles to place passes correctly even on quick slants. He will occasionally flash impressive ball placement by throwing a deep pass perfectly in stride, but this is almost exclusively in one on one coverage with no safety over the top when he can put enough air under the ball for his receiver to run under it. His accuracy, overall, is relatively poor. Mechanical: Griffin’s mechanics are not very good. His footwork could use improvement because even in a clean pocket at times he will look anxious, moving his feet unnecessarily. His throwing motion is pretty quick, however it is quite flawed. When he winds up to throw he drops the ball to his waist (or sometimes below, usually only on deep passes) which leads to a bit of a wind-up. He regularly throws off balance when on the run and doesn’t square his shoulders to the line of scrimmage when scrambling to the left, but seems to scramble to the right more than left. Mobility: Griffin’s mobility is very impressive as he has track speed. I would be surprised if his 40 time was slower than a 4.6. He is very elusive when scrambling and has the quickness/acceleration to get out of trouble in the pocket when he seems doomed to a sack at times. He has the speed to get the edge even when defenders know he is about to take off, and he obviously has the mobility to extend plays with his legs and to gain significant yardage with his feet. His mobility and his athleticism is probably his most valuable asset as an overall prospect. Pre/Post Snap Reads: I was not at all impressed with Griffin’s pre or post snap reads. Pre snap he rarely identified mismatches, and failed to check out of bad plays (such as a bubble screen against press-man coverage). He rarely, if ever, went through progressions and scanned the field and he frequently drops his eyes to scramble away from the rush. Usually he looks at his first read and if that isn’t open his second option is usually to run or scramble, not to scan the rest of the field. Pocket Poise: He leaves the pocket prematurely very frequently, and does not have the patience in the pocket to step up/side step the rush to buy time to scan the field. Rather, he will drop his eyes and try to scramble outside (usually to his right, like I mentioned before, since he is right-handed) to improvise something on a broken play rather than scan the defense. He will look anxious at the pocket at times and you can almost tell he is waiting for a chance to scramble out of the pocket. His pocket poise is very unimpressive. Intangibles: Griffin’s intangibles are a toss-up for me. On one hand, it is my understanding that he already has his degree after only three years at Baylor, including completing a double major. That is very impressive and speaks to his intelligence. However, his pre snap and post snap reads suggest a significantly less impressive football IQ. That means he is either book smart but not football smart, or he is football smart but just doesn’t study and watch film as much as he should. Neither is a very good sign. He seems to have some toughness though, but doesn’t seem to be a great leader. Character: Seems to be a good kid, plus he graduated in three years which indicates a pretty impressive work ethic and some intelligence. I don’t know a whole lot else about him though. It will be interesting to see how my opinion of his character changes as he progresses through his junior and hopefully senior seasons.